For the life of me... I can't find any current "Q Anon" posts... I'm not a very sophisticated "surfer"... please post LINKS to current Q Threads? THIS parallels nicely with Melissa Hodgman (Strzok's wife). 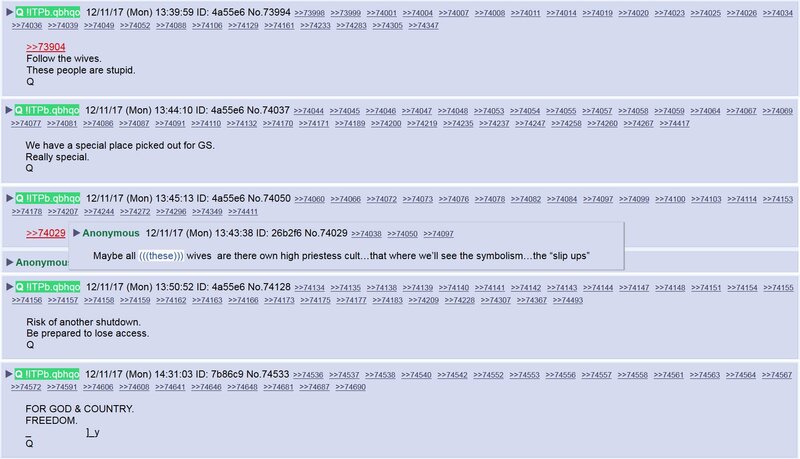 Q mentioned "Follow the wives" back then (Dec. 4), as well. false flag nuke 4th quarter dolphins vs patriots ? I am REALLY starting to think there had been a group of women in the shadows directing the show. That might explain why everyone thought Hillary was the bees knees. Even all the men being ousted as sexual preditors....the big feminist push. The official’s wife worked for Fusion GPS during the 2016 election. Can you guess where else she worked? Nellie Ohr, the wife of demoted Department of Justice official Bruce Ohr, who worked at Fusion GPS last year when the firm was working for the Clinton presidential campaign compiling the controversial anti-Trump Russian dossier, is listed as working for the CIA’s Open Source Works department in a 2010 DOJ report.